In 12-inch nonstick skillet, cook bacon over medium heat 5 to 7 minutes or until crisp. Remove bacon with slotted spoon; place in small bowl. Add beef and green onion whites to bacon drippings in skillet; cook over medium-high heat 5 to 7 minutes, stirring frequently, until beef is thoroughly cooked; drain. Stir in chili powder, milk, hot water, and uncooked pasta and sauce mix (from Hamburger Helper™ box). Heat to boiling, stirring occasionally. Reduce heat; cover and simmer 9 to 11 minutes, stirring occasionally, until pasta is tender. Remove from heat. Sprinkle with cheese; cover and let stand 2 to 3 minutes or until cheese melts. Drizzle with ranch dressing. 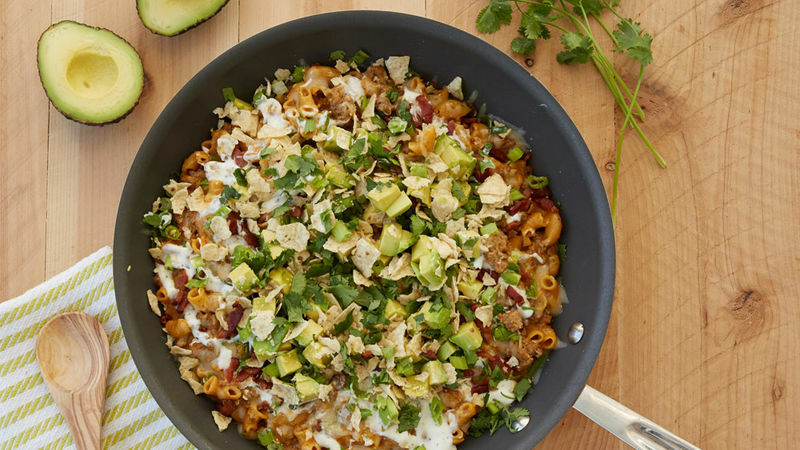 Sprinkle with bacon, green onion greens, avocado, tortilla chips and cilantro. Look for avocados that are firm, but yield to gentle pressure. If they are not quite ripe, place avocados in a paper bag, and let ripen at room temperature. Can’t find shredded pepper Jack cheese? A shredded 4-cheese Mexican blend makes a fine substitute.